Well I suppose at some stage I would had to do a feature on this mushroom. A select few people I meet often presume that as a mushroom hunter, I only go looking for this particular species. Well that’s just not so – I was in the right place at the right time as I stumbled across these bad boys. Simply observed for identification reasons – honestly officer! The Magic Mushroom or Liberty Cap (Psilocybe semilanceata) is the most notorious of all the hallucinogenic mushrooms (of which there are many), this being one of the most common and potent! It contains a chemical cocktail of psychoactive ingredients, most notably ‘psilocybin’ (hence Psilocybe) which is a naturally produced psychedelic compound, and is the main active substance. Ingestion of several mushrooms, whether eaten fresh, dried or powdered and added to food etc, can produce a variety of ‘psychedelic’ experiences similar to those produced by LSD. Since 2005 it has been made illegal to be in possession of this mushroom (in whatever form) and is labelled as a Class A drug – so there you go. The mycelium (the vegetative part of the fungus) feeds on the decaying matter of grass roots, so they are very at home scattered in pastures, lawns (sometimes parks), grassy roadsides and paths. The first thing to note is that the cap of the mushroom is hygrophanous, meaning it will change colour depending on how much moisture it retains. In wet conditions the colour will be yellowish-brown / brown with a slight olive tinge. It has a glutinous viscid layer which can be delicately removed. As it drys out the colour fades to pale buff or whitish with a dark spore stained edge. But the small conical cap remains a similar shape throughout these changes. It is elongate with striate markings (more noticeable when moist) with a distinctive small bump at the very top (umbo). The thin white/creamy coloured stem (sometimes with darker yellowish hues) is relatively long compared to the cap size, and can grow up to 7 or 8cm high. Sometimes you may notice a blueish tinge at the very base. The gills are pale creamy-grey at first, but as the mushroom matures they become a dark purple-brown. I’m not at liberty to say where I found these (or where to find others for that matter) as I was on a private reserve where I had permission to study. So please no questions about that on the blog or via email, thanks. There are plenty around at the moment, but be aware that they’re just for looking at …right folks? Psilocybe semilanceata or Magic Mushroom is hygrophanous and drys to a pale buff colour. 0.5-1.5cm across. Elongated conical shape with pointed bump (umbo). Yellow-Brown / Brown with olive hue. Drying to pale buff. 3-8cm x 0.1-0.2cm. Pale whitish/cream often with yellowish hues. Sometimes with purple tinge at base. Pale clay/creamy-grey maturing to dark purple-brown. Spore Print: Dark purpleish-brown (see how to take a spore print here). Pasture, garden, grassy roadsides and paths. Common in late summer to autumn. Hallucinogenic. Illegal to be in possession of. As the common name states, this Milkcap is often found around Birch trees, but it can also grow with other deciduous tress, especially if the ground is mossy, rich and moist. 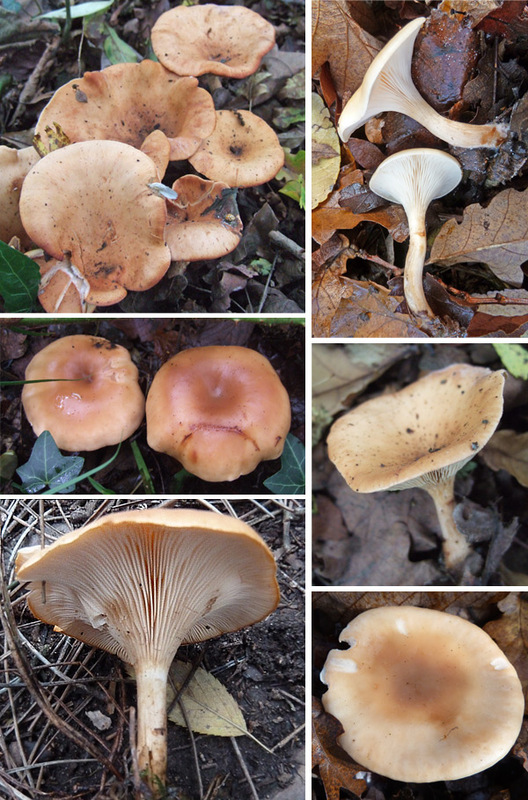 The Birch Milkcap Lacctarius tabidus is an extremely common member of the milkcap family. This group were randomly scattered about the place enjoying the damp conditions in a humble sized birch copse, just away from a grassy field footpath. 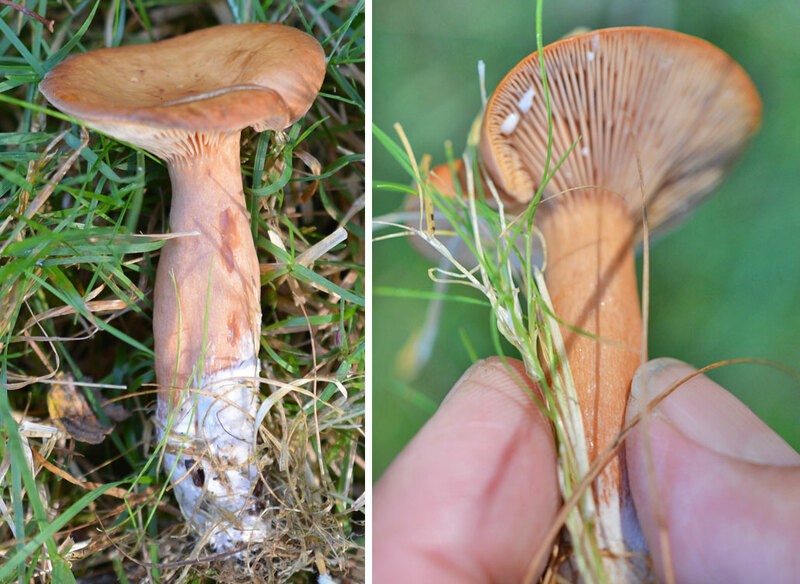 These are also one of the smaller Lactarius species, nicely formed with an all over yellowish brown (or dirty orange) colouring – they can be sometimes hard to spot! The cap grows up to 4-5cm across and forms a shallow central depression which often has a small bump in the middle. 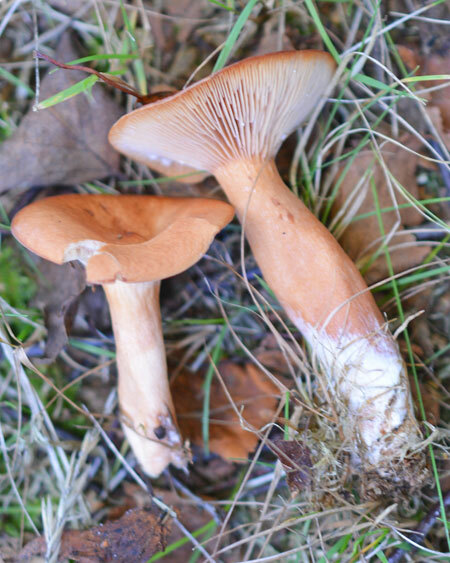 The similarly coloured stem (which becomes hollow after time) is fragile and easily breakable, and the crowded, slightly decurrent gills are again, similar in colour to the rest of the mushroom but paler. As with all milkcaps, the gills will seep milk (latex) when handled or damaged. The Birch Milkcap doesn’t have large quantities of it, so there may not be much being produced. But when you do get your hands on some, dab a portion of the milk on a handkerchief (or similar white cloth) and it will slowly turn yellow. This will be extra proof that you are dealing with Lactarius tabidus. The taste of the milk is mild, slowly becoming slightly unpleasant and bitter. The flesh is just the same, so I wouldn’t recommend these for eating – there’s too much of an acrid taste. Although, inedible it is indeed an interesting looking Milkcap and one to tick off your ‘found that’ list, so keep a look out when you’re around birch trees, especially if the ground is mossy and/or damp. Happy hunting. Lactarius tabidus – notice the shallow dip in the cap with a small central bump, and the seeping white milk (latex) from the crowded gills. 4 – 5 cm across. Yellow-brown or dirty orange. Thin flesh. Shallowly convex with central depression, often with a small bump. 4 – 8cm x 0.5- 1cm. Same colour as cap. Cylindrical, often narrowing at the top. Slightly decurrent, crowded. Similar colouring to rest of mushroom but paler. Producing white milk. Spore Print: Pale cream (with a slight pinky tinge) (see how to take a spore print here). Very common, on moist, mossy and/or damp ground near deciduous trees – especially birch. Late summer – late autumn. • Gills and flesh exude milk when broken or damaged. • Look out for different coloured milks and any changes after a while when exposed to the air. • Granular/fragile flesh similar to Russulas (Brittlegills), breaking easily. These mushrooms love to be in a crowd! They are one of the first to see in the year, fruiting from mid to late spring all the way through to late autumn/early winter. The Glistening Inkcap (Coprinellus micaceus) or should I say Inkcaps (plural) in this case, are extremely common; always found in small to large (sometimes very large) and tightly packed groups (caespitose) on or around broad leaf stumps/wood and buried wood. You really can’t miss them. The best time to find them is when they are young and still with an ovate shaped cap and hopefully haven’t been blasted by wind or rain. You will see the fresh caps are covered in a fine white powder that appears glittery or glistening, hence the common name. This coating, more often than not, will eventually disappear with age and with the interaction of the elements etc. Each small cap is around 1-4cm in size and generally ochre coloured with a darker cinnamon brown centre. Over time they will expand to produce a bell-like shape; their colour will fade or become dull, often with a greying (blackening) margin. 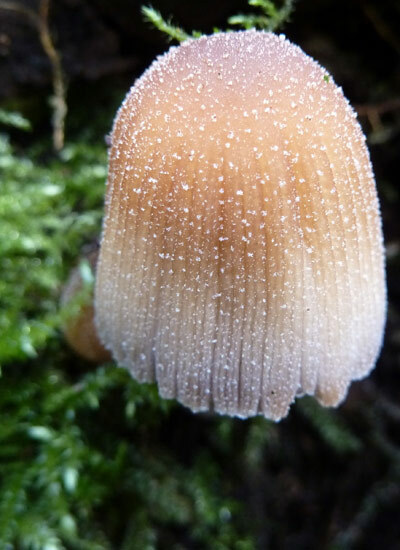 Also note that, as with many similar of the smaller inkcaps, there are very noticeable grooved markings on the surface, especially nearer to the margin. 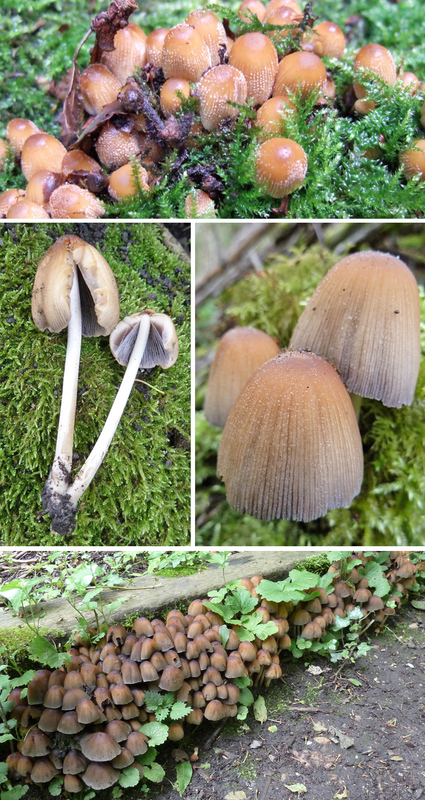 The gills are free from the stem and are initially white, maturing to date-brown and eventually black as they turn into an inky liquid (deliquescing) – another common trait of the aptly named Inkcaps. They are said to be edible, but they don’t seem to be much of a meal to me – or even appealing for that matter! So I haven’t tried to cook and eat any. Please leave a comment on this post if you have indulged – but I can’t imagine there are many recipes out there for them – or maybe there is! Glistening Inkcap (Coprinellus micaceus) growing in large, densely packed groups feeing off old stumps and dead wood which is sometimes buried beneath the surface. Ovate (becoming bell-shaped over time). Ochre coloured; darker brown at the centre. Becoming duller with age. Spore Print: Date brown (see how to take a spore print here). On or around broad-leaved tree stumps, dead and/or buried wood. In large groups. Late spring to early winter. • Most species gills dissolve into an inky black liquid as the black spores ripen. • Grow on the ground, wood or dung. • Smaller species have distinct radial grooved markings on the cap. It may seem a little strange to feature this mushroom in February when it’s actually an autumn species. Well, mainly! But year after year I often come across the Tawny Funnel (Lepista flaccida) in January or early February, as in this case. 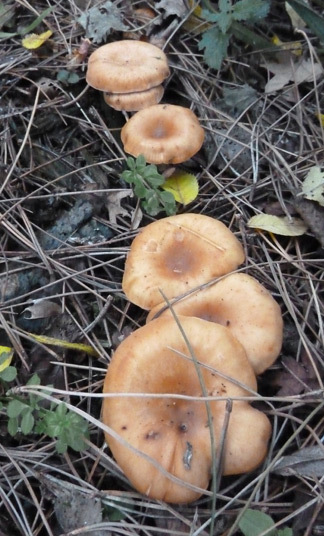 At first I thought I had an unfamiliar species to identify – but I have read (and heard) from fellow foragers and field mycologists that this is not so uncommon. After all, the Tawny Funnel is usually one of late fruiting autumn species. Maybe it has unfinished business -waits until milder times at the start of the year to carry on. Who knows? When young, the cap is flattish and convex but soon develops its distinctive ‘funnel’ shape which causes some confusion, as you would think that you’re dealing with a true Funnel mushroom – i.e. a Clitocybe species. In fact this mushroom has been formally known C. flaccida and some mycologists have named it C.inversa, or consider it to be a different species entirely. One reason it has been moved to this genus is because of its warty spores and moveable gills, features the same as the other common Lepistas (or Blewits) such as the Wood Blewit and Field Blewit. The real confusion starts when you compare it to the Common Funnel (Clitocybe gibba) which looks like its identical twin! However it is only situated in broad-leaved woods and heaths, whereas L.flaccida appears in both deciduous and coniferous woodland, especially nutrient rich soil. This mushroom is often found in clustered groups and full or partial fairy rings in the soil and leaf litter. 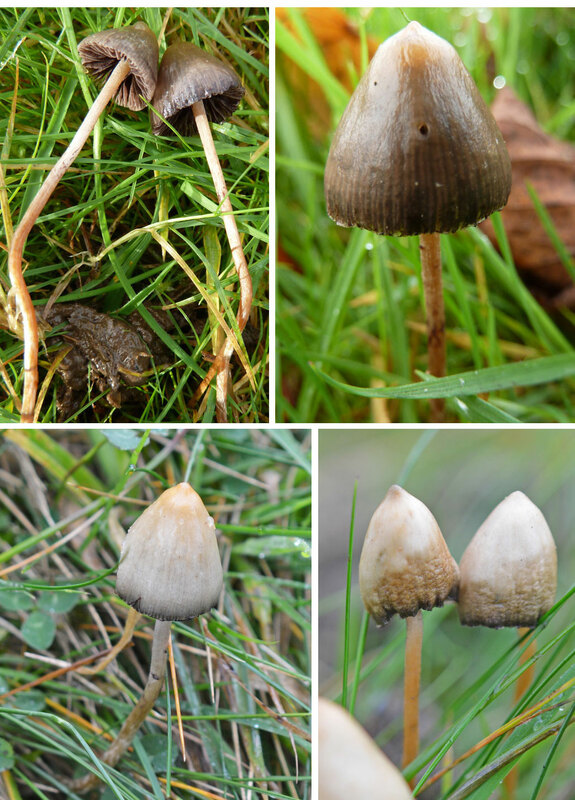 Average cap sizes of mature specimens are around 5 to 9cm across. There are many changes throughout its life cycle, so expect to see variable colour variations of this mushroom. The young flattened-convex cap is pale ochre and is strongly hygrophanous (unlike C.gibba) and you will see pale/darker areas depending on the moisture in the cap. Also look out for water marks around the edge of the cap. With age, it becomes darker orange-brown (shades vary) as the distinctive funnel becomes more apparent. There may also be several darker spotted areas scattered across the surface. The whitish-yellow gills are crowded (more so than the Common Funnel) and heavily integrated with the stem (decurrent) which is paler in colour than the cap. It is often curved slightly towards the white woolly base. Smell is also an important factor here, as the Common Funnel and Tawny Funnel differ. The Common Funnel has a faintish odour of almonds (also described as new-mown hay!) whereas the Tawny Funnel is more or less non descriptive, but there may be a faint spicy odour. This mushroom is a great challenge, so good luck in identification and your spring forages in general. Enjoy. Notice the varied shades from light ochre to tawny and the very crowded decurrent gills. 2-9cm across. Initially flattish to convex then funnel shaped. Pale ochre, darkening tawny brown with age. Often darker spots. Thin flesh, pale to tan. 3-5cm x 0.5-1cm. Paler than cap. Becomes hollow. White woolly base. Very decurrent, narrow & crowded. Whitish to yellowish. Spore Print: Creamy white (see how to take a spore print here). On soil and in leaf litter of coniferous & broadleaved woods. Autumn. Sometimes in January & February. Edible, but flesh is too thin & has an unpleasant taste. • Small to medium size. Pale to brownish caps. Some feature lilac/purple colouring on cap and stem. • Pale pink spore print (see how to take a spore print here). It’s a great time of year to start going out foraging more often. It’s late summer with a good portion of rain to get things going. And Autumn is not too far away just round the corner. Many different species start to pop out and show their faces. The problem is though I do tend to get covered in insect bites that itch like crazy! Besides these problems, I was fortunate enough to find two different Parasols not too far away from each other in and around my local park. The Parasol Mushroom (Macrolepiota procera) and the Shaggy Parasol (Chlorophyllum rhacodes – formerly Macrolepiota rhacodes). When I first published this post, the Parasols were both from the genus Lepiota, representing the larger specimens in this group. The name ‘Dappering’ is also used to label the majority of this species, but now the Shaggy Parasol has been chosen to stay in the Chlorophyllum genus. The Parasol mushroom (M.procera) is fairly common and I found this one on the edge of parkland in thick grass (shared with nettles that added to my stings). It’s a mushroom you can’t really miss – standing their tall and proud shouting out it’s presence to the world. It was a solitary soul but sometimes you can find small and large groups of them together. As the common name suggests, the open cap mimics the familiar shape of a parasol. When young, the cap is egg shaped and flattens out when it expands. The cap is a pale buff to white/creamy/brown colour with darker brown shaggy scales. Notably, it has a prominent bump on the top in the centre (umbo). It’s long slender stem (slightly thicker near the base) has scaly snakeskin markings with a large (double) ring which can be moved up and down. Great fun. This scaly snakeskin appearance on the stem that helps in identifying it from a Shaggy Parasol which does not share this characteristic. Also note the smell, which is very distinctive (like ‘warm-milk as I’ve seen it written somewhere). The Shaggy Parasol on the other hand has no real strong smell at all. This is an excellent mushroom to eat. Generally good as a fry up but I’ve heard they’re great deep-fried with dipping sauce on the side. Yum! A few days before I had found myself a Shaggy Parasol (Chlorophyllum rhacodes) located on a patch of grass in the conifer wood close to the park (can also be found in grass gardens and shrubberies). It was kindly but indirectly pointed out to me by a passing little boy, shouting ‘MUSHROOM!’ to his mother who was very uninterested and replied ‘Don’t touch!’ Very wise words indeed – just leave it there – leave it for me (heh heh)! Shaggy Parasol: Distinctive brown scales curling away from the white cap & thick bulbous base of stem. Notice the small compact shape of a younger specimen. (Locations: Front grass garden and conifer wood). The rounded white cap (expanding to almost flat with age) has brown scales on top that curve upwards and out giving it a shaggy, torn appearance. The stem at the base is thick and rounded unlike the Shaggy Parasol which isn’t as bulbous. This shaggy mushroom can be easily mistaken for the Parasol which is understandable. Good tips on how to identify this mushroom over the Parasol are the thicker, stockier appearance, no ‘snake-skin’ pattern on the stem and last but not least it’s colouring when bruised. If fresh, the stem and gills will bruise reddish-brown. Older specimens will have these reddish-brown tints appear naturally. Edibilty-wise, this can be a very nice treat indeed – for some that is! It must be cooked, but it can disagree with some people and cause digestive upset or even a skin rash. It’s always best to try a little first and see how you go. One last word of warning though – Never pick smaller sized parasols, or what appear to be parasols. You may by mistake obtain one of the smaller species of Lepiota (Dapperlings) which look like smaller versions of Parasols (around 7cm or less in diametre). Some of these are very poisonous and will cause you some serious grief. So, as a good rule with Parasol mushrooms only pick ones that are at least 12cm in diameter. As mentioned in the comments below (Nov 7, 2017), I thought it wise to mention the Green Spored Parasol (or False Parasol); Chlorophyllum molybdites, which is predominately most common in North America and causes gastrointestinal poisoning; such as diarrhea and/or vomiting a few hours after consumption. As of 2009 there has only been one record in the UK and I believe it may be still quite rare here. 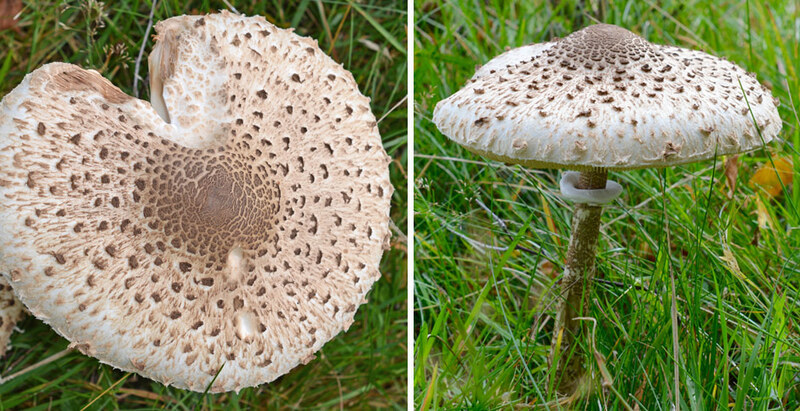 It looks very similar to edible Parasols (especially the Shaggy Parasol), but lacks the snakeskin pattern on the stem and has coarser cap scales. Fortunately a simple spore print test will reveal green spores. The gills, initially white often turn darker/greener with age. I’m still out there in the freezing cold, treading on the ice crusted mud and woodland grass in search of any of those winter treats still hanging around on the old dead wood. And I also need a change from mince pies, turkey, wine etc… and pretend I’m losing a few pounds in the process. I was o ut in one of the National Forest woods, closest to where I live. It had to be close as I was on the motorbike and had to make the journey short. After all, it was ‘zero’ degrees celcius! Initially I was looking for any signs of Oyster mushrooms. I know they’re around pretty much all year, but I need to find out more of where that is! 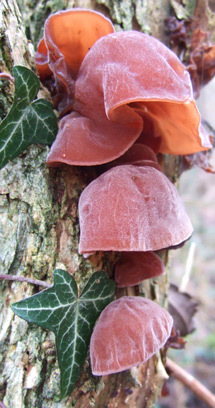 Instead I stumbled across (nearly literally) a modest collection of Jelly Ear (Auricularia auricula-judae) or Jew’s Ear. They are genuinely funky in appearance, and absolutely great to touch, almost like a mixture between silk and rubber! However, it was so cold that some had completely frozen solid with some only half frozen. I quickly took some snaps to show the ice and ear together. They’re around most of the year and grow on living and dead wood, mainly elder but also with beech and sycamore. They are edible but not full of flavour. I didn’t pick any of them at this time, but I’m interested to know if anyone has any interesting recipes to use with them. I believe they are used extensively in Chinese cooking – broths and soups etc. generally to add substance rather than for added taste. Update Feb 2014: Since I received a recent comment from a blog follower mentioning the health benefits of this particular fungus, I had to check it out. It’s fascinating to see how many vitamins and minerals it possesses. It really is a super food! To see the health benefits of the Jelly Ear, click here.